for details on how to enter! A while ago, I went on a ribbon buying spree! I found a listing on ebay for some really great ribbons at a really great price and bought loads and loads of ribbon! 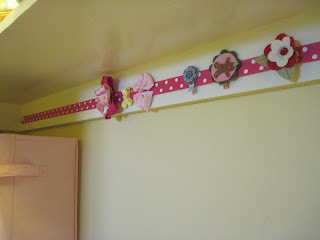 I had great plans for that ribbon but one thing after another kept me from my craft room. Around Christmas this year, I started buying a lot of hair clips for Grace and I was just storing them in a jar on her shelf. But as she started to roll and move more, it just wasn't convenient to have to reach for the jar, screw the cap off and then dig for the appropriate hair accessory. I considered buying a clip holder but really didn't want to spend the money on something I thought I could make myself if only I had the time! Well, since I didn't have the time to make a clip holder, I decided to use thumb tacks and attach a strip of ribbon under the shelf above Grace's changing table. It works perfectly! 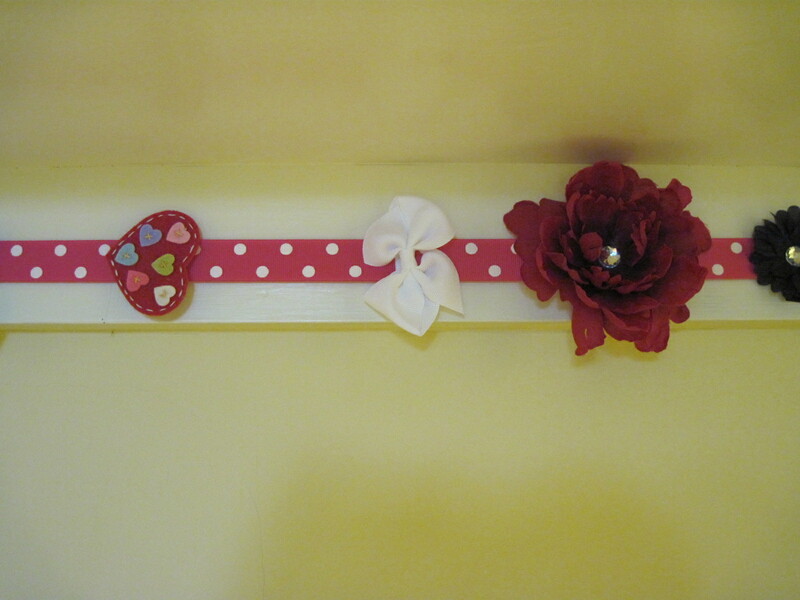 To hide the tumb tacks, I just put a bigger bow or clip right next to the tack so it overlaps and covers the tack! As you can see, I still have plenty of room for more bows and clips! Right now, Grace isn't thrilled with anything on her head, so we've been skipping the hair accessories. But I'm sure that eventually she will WANT her hair all pretty with bows and clips and we will soon have that ribbon filled with new little pretties! 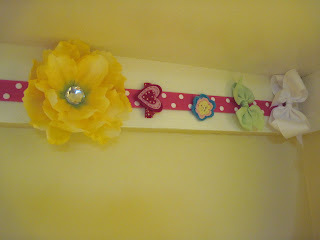 Check out this post that tells you where to find some great hair clips for your little girl! The Pickled Pumpkin is a wonderful Etsy shop with such adorable hair accessories! Read about The Pickled Pumpkin here!